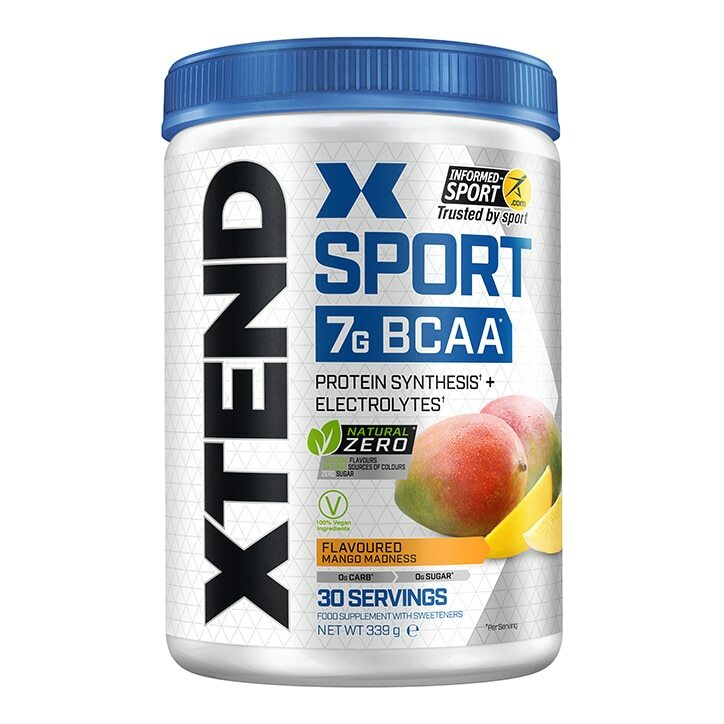 Xtend HydraSport Electrolyte + BCAAs, support muscle protein synthesis and electrolyte balance. Xtend HydraSport combines the clinically studied dose of BCAAs at a 2:1:1 ratio with a revolutionary Electrolyte & Performance Hydration blend. Xtend HydraSport proudly wears the Informed-Sport logo. The Informed-Sport logo signifies that every batch of this product has been tested for banned substances. Built on the foundation of the legendary Xtend BCAAs, Xtend HydraSport combines 7g of BCAAs with key ingredients to support hydration. This delicious calorie, carbohydrate, and sugar free drink mix helps to support muscle growth and replenishment of electrolytes. Take two level scoops daily and mix each level scoop with 250-300mL of water (adjust for taste preference). Consume 1 level scoop during exercise and 1 level scoop after exercise, or consume 2 level scoops throughout the day. Do not exceed recommended daily serving. Food Supplements should not be used as a substitute for a varied, balanced diet and healthy lifestyle. L-Leucine, L-Isoleucine, L-Valine, Acidity Regulators (Citric Acid and Malic Acid), Sodium Citrate, Coconut (Cocos nucifera) Water Powder, Magnesium Salts of Citric Acid, Potassium Chloride, Flavours, Sodium Chloride, Sweeteners (Sucralose and Steviol Glycosides), Anti-Caking Agent (Calcium Silicate), Colours (Tartrazine and Allura Red), Vitamin B6 (Pyridoxine Hydrochloride). This product is only intended for healthy adults, 18 years of age or older. Do not use if pregnant or nursing. Consult with a licensed, qualified healthcare professional before taking this or any food supplement product. Discontinue use 2 weeks prior to surgery. Immediately discontinue use and contact your healthcare professional if you experience any adverse reaction to this product. Use only as directed. Do not use if safety seal is broken or missing. Store in a cool, dry place. KEEP OUT OF REACH OF CHILDREN. This product is sold by weight, not volume. Some settling of powder may occur during shipping and handling, which may affect density of powder. This product contains the servings indicated when measured exactly by weight. Tartrazine and Allura Red may have an adverse effect on activity and attention in children.